1963: The Beatles (and Nell?) relax in the sun in Weston-Super-Mare during a week’s appearance at the local cinema. Actually I think that is one of the Pacemakers back there by the wall. 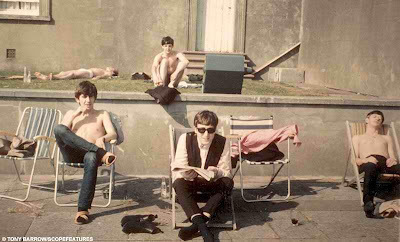 The pic is cropped to show only the Beatles but Gerry and the Pacemakers were sunbathing with them. I guess Neil was there too but I don’t see him in any of the pics I have.